Sometimes I find it funny to think about the amount of time I used to spend getting my hair ready before leaving the house. My hair is thick, coarse and stubborn and leaving it naturally curly would have been the easy route... but no, I would stand there with my cheap flat iron (after making sure every strand was completely dry) and go over and over until everything was smooth. That wasn't the end though, of course not. Then I had to use my curling iron to get some ends to flip out and some to flip under and the shorter, bang-like pieces to be placed just right... ahh, those were the days. Now? Now I have somewhere in the range of 10 to 15 minutes to get showered, dressed and ready to go from start to finish before the natives get too restless around here. Just the time it takes for my flat iron to heat up would be too long, not to mention the actual straightening. Until, of course, I tried a REAL flat iron. Until I tried the Hana Professional Flat Iron 1" - Pink Edition from Misikko. If you've never visited Misikko, you're missing out on an amazing collection of professional styling tools and beauty products available from the top names in the business. From hair dryers to curling irons to makeup, everything you need is in one place to help you find the right salon tools and products at the right prices. But, back to flat irons. Where to go for CHI flat irons for sale? Misikko has them and they're even on sale. How about a BaByliss Flat Iron? Misikko has those too, from ultra-thin to Titanium. Don't worry if you're not a flat iron connoisseur though, they also have a Best Flat Iron page with recommendations broken down into sections so that you can find the right one for your hair texture, length and needs. As for the Hana Professional Flat Iron 1" - Pink Edition, I knew that my hair would really put it to the test. Just unpacking the box was fun, as Misikko includes a large amount of extras along with the flat iron - a bottle of Hana ShineShield Thermal Protectant, a heat-proof silicone mat and storage pouch (perfect for travel) and many more small goodies! At first glance, the features that I loved about this Hana Flat Iron before I had even touched it to my hair were the adjustable temperature dial, no-slip handle and that it could be used on damp hair. No more making sure to wash my hair hours before straightening it or attempting to avoid frizz with a hair dryer, I was now able to go from damp to dry with one great item! With my thick hair, I need a flat iron that really heats up in order to have any results and the Hana Professional does just that. In the past I've found that my flat irons either can't flatten out my curls and I have to go over each section multiple times or they feel as though they are sizzling my locks and burning off the ends. However, even with my hair being a little damp, the Hana Professional glided right over each section and left it smooth and shiny. It was easy to start with the bottom layers and, with a twist of my wrist, give them a little flip out and then move on to the top layers and turn them under. In only a few short minutes, I was finished and could put the flat iron down on the heat-proof mat and not worry that my counter would be damaged. After using this flat iron, I am so happy with how my hair looks and feels that I have a hard time not continually running my fingers through it! The ceramic-tourmaline plates self-adjust to my hair and really smooth each follicle to leave it looking sleek and conditioned for the rest of the day. After years of using cheap flat irons that never really did the job, I can understand why just going with a professional one makes much more sense. The Hana Professional Flat Iron 1" - Pink Edition is truly a luxury styling tool and the difference is huge. Retailing for $204.99, this flat iron is on sale at Misikko for $119.99... which is probably LESS than the total amount I've spent replacing junky flat irons over the years. 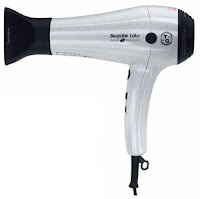 Whether you are looking for a high-quality hair dryer, curling iron or flat iron, Misikko carries the brands and styles that will far out-perform the competition. Considering the amount of use that these items get, it's worth having the best! Thanks, Misikko, for giving me a way to combine 3 steps (blow drying, straightening and curling) all into 1 and leave my hair glossy and smooth. And, for always looking professional and styled in your little truck, thanks, Mail Carrier. Don't you just love it! I received one last week and it is my new best friend!! I use to get so mad at my other cheap flat irons and just give up and put my hair up in a pony tail! No more! yippee!!!! that's cool that the flatiron comes with the little pad to rest it on when you're not using it. I got a perm in the ninth grade and it never left my hair (seriously) so I'm always in the market for a good flat iron!! I have this flat iron too and love it! I am so jealous, it sounds like all of you have this awesome flat iron. I would love to try it and I love that it is PINK. :) Great review Xenia! Lol. I have a flat iron but mine is not pink:( Thanks for the review Xenia!